Michael Schmidt&#8217;s way of looking at things is characterized by extreme lucidity and rigor — his view of bread baskets, cages in fish farms or apple-washing plants has a serial analytical quality. Editor's Note: We are saddened to learn that German photographer Michael Schmidt died just three days after being award this prize. We offer our condolences to his family and friends. His passing is a loss for all of us. 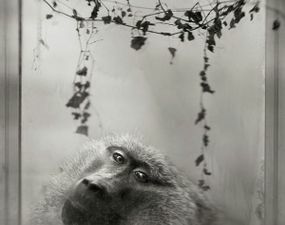 Michael Schmidt was announced as winner of the fifth Prix Pictet photography prize, selected from a shortlist of eleven. This year's edition was based around the theme of "Consumption" and Schmidt was selected on the basis of his monumental work Lebensmittel (Food Stuff). The prize, with a value of 100,000 Swiss Francs (USD$112,500) was presented to him by Kofi Annan, the competition's honorary secretary. Already, the announcement of the prize winner, featuring Schmidt's photograph of a perfectly manufactured and polished green apple (similar to thousands of photos to be found in a Google search), has drawn widespread criticism that such a "commercially mundane" photograph should win top billing. But, really, that is one of the arguments in favor of the series of photographs — they force the viewer to question basic assumptions about the ways in which photography can communicate complex ideas in our time. "I am a 'blind alley' photographer...that means that I stroll straight into a cul-de-sac and can’t find a way out. Then I come to terms with this as a sort of condition, and at some point later on, I’m back on the outside again...That is to say, failure or making mistakes is an integral part of my way of working." 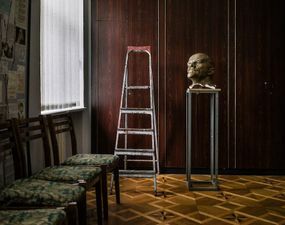 Michael Schmidt’s ability to translate apparently contradictory elements of his photography into a valid form puts him in an outstanding position among contemporary photographers. Though he adopts an unusual position with his constantly different approach to photographic and social questions, his innovative project-led working methods and his extreme commitment have made him a model for a generation of young photographers. Unlike some of Schmidt’s earlier series, these photographs do not strike an attitude of rage or accusation. On the contrary, his way of looking at things is characterized by extreme lucidity and rigor. His view of bread baskets, cages in fish farms or apple-washing plants has a serial analytical quality that is sometimes reminiscent of the objective photography of the 1920s. But it is precisely the contradiction between classical photographers’ latently optimistic approach, who stage their industrial production motifs in a perfect aesthetic and Schmidt’s realistic view that makes a distressing impression when looking at the project as a whole. While his individual images demand objective consideration, the series persistently undermines this dominant objectivity by the use of repetitions, accentuations and rhythms. The exhibition and the catalogue for Lebensmittel form two different media. When asked about how he puts together catalogues, Schmidt said, "For example, if I am arranging a double page spread, it is important for me that one plus one equals three. A third, invisible image must impose itself in between. That is to say, two pictures are combined to form an argument and a third picture results from it. This can perpetuate itself indefinitely, with the effect that when you are looking at a lot of images, at some point another one forms in your mind distinct from the one you are objectively observing." 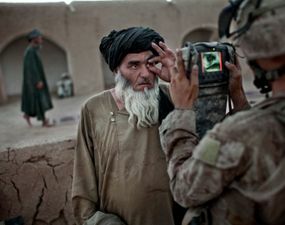 Editor's Note: Read more about the artist at the Prix Pictet website. All of the photographs from the winner and the shortlisted photographers will be showing at the Victoria & Albert Museum in London from May 22 to June 14, 2014. 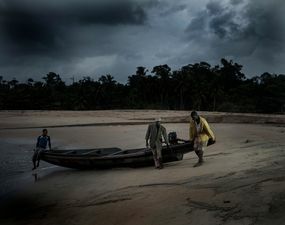 Drawn to the promise of iron ore hidden deep in the jungle, corrupt government officials and international investors are adversely affecting the lives of fishermen in South Cameroon. Can you love something and still keep it locked in a cage? 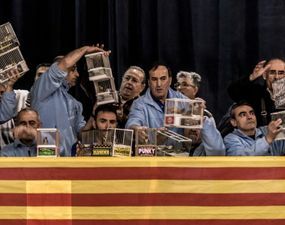 On the outskirts of Barcelona, young and old men meet on a regular basis for a unique kind of contest: competitive birdsong. What does a typical two-hour period of life look like for a multi-tasking mom, artist, teacher, wife? 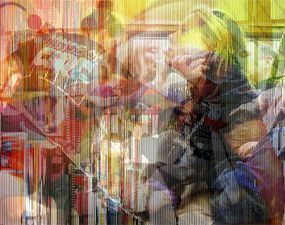 H Jennings Sheffield juxtaposes digital slices of her life to create dizzying visual collisions depicting everyday modern life.